However, the transition to service revenue models is not taking place fast enough. Executives know they need to do it, but they are failing. According to our survey, there is a disconnect between the size of the opportunity and how much is being captured—only 29 percent of respondents indicated services would grow faster than products in their firm. Complexity and a lack of digital capabilities are holding firms back. The top inhibitor to transitioning to a service model is the difficulty of managing a “two-front war”—products and services simultaneously. However, their ability to capture significant value and leapfrog competitors hinges on accelerating to a service model. must converge. 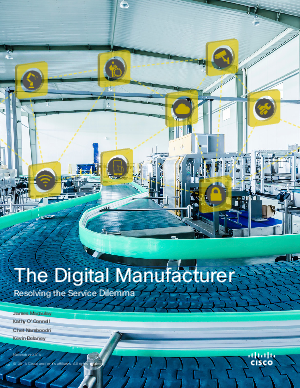 To unlock the full potential of the service model, while still improving products, industrial machine manufacturers and end-user manufacturers need to digitally transform their businesses. Digital transformation must start with top-down leadership, and requires changes spanning people, process, and technology. With the foundational business process and technology capabilities in place, manufacturers will have greater business agility to leapfrog competitors; derive insights that will create organizational efficiencies and reduce silos; and build a new customer, partner, and organizational experience for the digital age. Recent economic analysis by Cisco reveals the payoff for a $20 billion manufacturing firm that digitizes is a profit upside of 12.8 percent over the next three years, and 19 percent over 10 years.